The gastrocnemius makes up a large portion of the calf muscle. The muscle below it called the soleus completes the large muscle belly in the back of the lower leg. The muscle connects the upper leg bone just behind the knee to the heel bone at the bottom of the foot. Below is a photograph of the back of the calf that is swollen and bruised from tearing of the calf muscle. The muscle has very good blood supply and bleeds significanty when torn causing the extensive brusing and can be very painful. Pictured below is an MRI of the calf muscle that is torn. 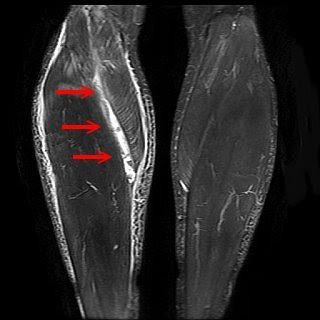 When compared to the other leg, also in the picture, the tear in the muscle can be seen as a white color due to the inflammation in the area and highlighted by the red arrows.